As anyone can clearly see the above topics address some key issues linked to the Capitol Improvement Project (CIP). While Bill Carlin who works for the SFPUC in his presentation makes better sense then he did before - it still puzzles me why Tony Irons who is an architect by profession should be in any way connected with the CIP and the over $3.6 billion project in a large measure. 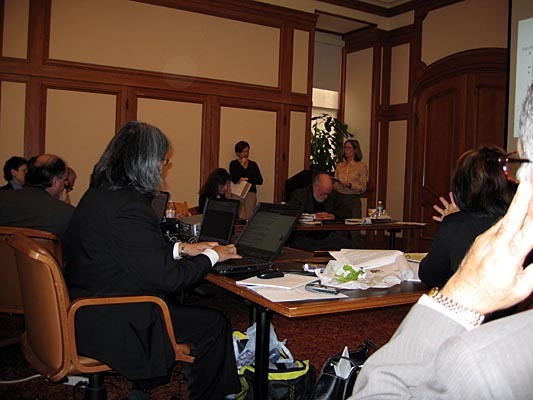 Suffice to say the SFPUC is already handicapped by the General Manger Susan Leal who has no engineering expertise linked to the CIP projects which further acerbates the problem having an architect dwell on the projects without qualified engineering expertise - playing sidekick and second fiddle. Arthur Jensen from Bay Area Water Supply and Conservation Agency as usual revealed many pertinent facts that the SFPUC would do well to note. While we all are very fortunate to have plenty of Hetch Hetchy water we still have not attained the main issue of containment. The weak Calavares dam for example could break open and flood a wide region. It is never fully utilized for that very reason. To date we have no empirical data linked to the amount of water that flows from the Don Pedro river into the Hetch Hetchy system. There are other factors that the public has no real data to understand the flow and more to gauge the quality of good drinking water further down the pipeline from the pristine source that is Hetch Hetchy. Principally the main reason the CIP was put in place was to address the main operations in case an earthquake of a major magnitude struck. We know for sure that many dams will suffer and more the old pipelines which are very old. We have also to take into account the over 900 miles of City pipelines that are very old and will surely fail. Having the above scenario in mind the issue of Supply and Demand becomes a moot one. There will be no mechanism in place to deliver and even though the demand may be there - the issue becomes moot with a CIP that has no repaired, replaced, and upgraded pipelines in place. An Environmental Impact Report will aid the experts and more the educated public to assure that the $3.6 billion dollar - has accountability and transparency. Of course SFPUC lack engineering policy making at the highest level - the other counties have them in place. The Hetch Hetchy system is not the only source of water there are other water sources that are in place, helps and adds in the delivery of clean drinking water to many thousands of customers. Ground water recycled water, well water, dam water all serve thousands of customers in the Alameda, San Clara, and San Mateo Counties through the Regional System. Future projections as far as new residents can be as much as 320,000 new residents - with over 307,000 new jobs in businesses, schools, and community services adding to the demand of clean drinking water. Future regional piping system may be the way to go. Lastly the indigenous people once cared for all the water as a precious commodity. Today our philosophy has changed and many have come to believe in conservation and using recycled water for the better of Mother Earth. San Francisco has no idea of how many toilets use low flow systems - we will find out at the next meeting. In Israel they have the yellow and brown button - well, desalination and the preciousness of clean drinking water is fully realized in Israel. We in the Bay Area get our water from Hetch Hetchy and other sources easy and on a platter. We take for granted the blessing of the gods. Our habits should change and conservation should become the norm. We ought to learn from the indigenous people - they cared for the rivers, the wet lands, the marshland, and all that provided life where pristine water flowed. The animals, the birds, the fish, the insects, the frogs to the First People were all signs of life. Where are the bears and the frogs? Where are the streams for the salmon to spawn? Who are the culprits that pollute water most? When did it all start happening? What did Lewis and Clark see and what would they see today? Today, we do not mention the Ohlone, the Miwoks, the Pomo, and the many other Native American tribes. We fear if we mention the First People - we have to mention the shame of our actions - the scalping, the reservations, the stealing of the land that belonged to our First People. Water is a precious commodity - the most precious that all life depends on. The First People cared for our water but we all have failed them. The White person just like the SFPUC talks the talk but fails to walk the walk. The system is corrupt and lacks leadership - the issue is made all the more complicated when inept leaders are paid $300,000 salaries for doing a lousy job. Architects lead engineers and bakers lead shoemakers - one does not need to be a rocket scientist to figure out whom is leading whom down the precipice of destruction. There are some that can save face - but they are far and between. SFPUC you have much to learn and the recent changes have not been good. Too much talk and very little concise action.